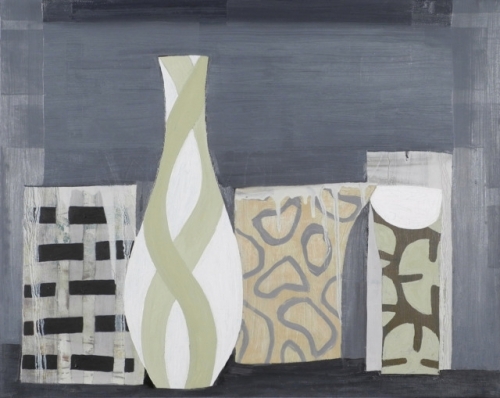 VItamin A: William Willis' "Still Life With Grey"
The large, jagged forms and muted, achromatic palettes of William Willis' current exhibition at Hemphill Fine Arts are what can be expected from the 70-year-old artist. Nonetheless, the scale and presentation of the works, as well as Willis' visual references to other artists—like Philip Guston, Ciao Fonseca, and most specifically Brancusi—come as a surprise. "Still Life With Grey" is a charming oil painting of four vessels that recalls Giorgio Morandi, the great Bolognese still-life painter. Like Morandi's tonally quiet vessels, Willis' are wobbly. The former was prone to simulating volume, but no such depth exists in Willis' painting. The vessels in "Still Life With Grey" function more like portals: paintings within paintings, wind sprints for a more arduous future contest.